In many ways Mabel Strickland was a tragic figure. Her political forays, inspired by the imperialist policies of the father she adored, and to whom she was a son manqué, had become outdated by the time she inherited his mantle. Her parliamentary career cannot be said to have been a shining one. First elected in 1951, she resigned soon afterwards for having supported the coalition against the wishes of her party. The new party she founded, the Progressive Constitutional Party, achieved a modicum of success in 1962 thanks to the particular instructions that had then been issued to voters. Ignoring the winds of change sweeping the post-war world, she had at first embraced and then opposed Mintoff’s attempt at integration when she realised that this would have made Malta adopt laws that would not conform with the Catholic religion. A strong proponent of emigration, she believed one-third of the Maltese should seek pastures new. She had also at first strongly opposed Borg Olivier’s proposals for independence, only to reluctantly accept the inevitable once she was assured that Malta would remain in the British sphere of influence. With independence, she and her party practically bowed out of the political scene. And yet Strickland was a successful figure, too. The newspapers her father founded were to become, under her leadership, the flagships of Maltese journalism and remain so even to this day when the printed media is facing a dire future. Her editorship of the Times of Malta during the ravages of the war is legen­dary, as is the proud record of never having missed an issue, even when the printing press was gutted by political arsonists. Through her newspaper she stood up for decades against her bugbear Mintoff, who went through all sort of legal contortions to hobble her, to the extent of changing marriage and adoption laws to stymie the transmission of her heritage. Still, Strickland must have had the last laugh because, when she died in 1988, Mintoff had been voted out of power. She then had the single honour of being buried next to her father at the Mdina Cathedral, making her one of the few women to be interred there. The Bejn Storja u Miti series, edited by Sergio Grech, has already published a number of most interesting books about various personalities who have left their mark on Malta’s politics and society in the 20th century. The series is indeed an invaluable historic record, made all the more attractive by its readability and the professional presentation. Grech has managed to bring together 15 personalities who either knew Strickland personally, or worked for her, or who have carried out research about her and her role in Maltese society. Three former editors of The Times of Malta, George Sammut (of Roamer fame), Victor Aquilina, and Laurence Grech, all give their reminiscences of working with her. She could be a harsh but fair taskmistress, but always demonstrated an understanding and humane heart, as her employees all readily agree. Sammut, who died in 1984, writes about Strickland’s dealings with Mintoff, saying that “she didn’t quite know what to make of him”. He had had an English education, which was most positive in her eyes, but then he also had Fabian sympathies and an anti-establishment attitude that did not go down at all well with her conservative nature. The latter attitude would eventually take over from the former. Aquilina and Grech share their experiences of the woman. Strickland merges as a person su­preme­ly dedicated to her work who instilled a similar work ethic in her employees, most of whom would remain unfailingly loyal to her. Aquilina discusses whether she ever had a love in her life, while Grech gives an account of her achievements, noting that the principles and values she believed in and fought for throughout her life should earn her the gratitude of the nation. Charles Xuereb, who spent three teenage years as a young journalist with Allied Newspapers, also recalls some personal experiences. 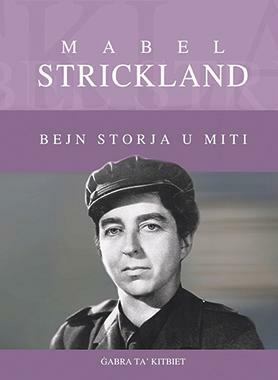 He writes of Strickland in the collective memory as the pioneering political person but also as a articulate proponent of the colonial mentality. Historian Simon Mercieca ana­lyses the trustworthiness of what has been written on Strickland and which has led to the formation of the people’s memory of her. The two main sources ana­lysed are Joan Alexander’s biography and Anthony de Trafford’s important biography of his own mother, Strickland’s sister, with whom she had “a love-hate relationship”. Another late contributor like Sammut, Prof. Victor Griffiths, a staunch follower of Lord Strickland’s party literally from early childhood, writes about her as a party leader stressing her ability to place larger issues above personal ones and the problems she had to face in reaching out to voters because she could not speak Maltese. Although her actual parliamentary career was neither long nor particularly illustrious, Godfrey Pirotta makes an excellent and deep analysis of her contributions. Perhaps one of her most indirect contributions to the august chamber was the ink stain on the Perellos canvases, which came about when she dodged an inkpot hurled at her by an MLP member! It has since been removed, though. André P. Debattista takes a wide-ranging view of the context of her political beliefs and battles. Debattista stresses the influence on her of Lord Strickland, although she had a gentler nature. Debattista’s contribution can easily serve as a general introduction to the woman and her marginal political and, more im­por­tantly, journalistic roles in the making of modern Malta. Tonio Borg divides Strickland’s political journey into two: before and after the war. In the former time she was the right-hand person of Lord Strickland’s party; in the latter she became the leader of her own political party that split from what had remained of her father’s. What, he says, was never in doubt was her honesty and sincerity. Max Farrugia writes about Strickland’s role in the religious-political controversies of 1928 and 1930. When Lord Strickland became embroiled in a quarrel with religious authorities, Strickland was the secretary and practically the factotum of his party. She strove hard to smooth the impasse and even went to London and the Vatican to explain her father’s position. In spite of the fact that she was most conscious that it was her being a woman that spoiled her political progress, Strickland was one of the earliest pioneers of women’s rights, going back to the 1920s. George Cassar discusses her significant female presence in the male-dominated worlds of politics and business. A much longer, insightful contribution by Carmen Sammut and Nadia Abdilla analyses Strickland’s role in journalism and her battle for female suffrage in colonial Malta. Back in 1931 she had even forwarded a petition signed by 428 women for the Constitution to be changed to give women political rights. She cogently argued her points in front of the Royal Commission and also met Lord Askwith privately, but it was concluded that the issue “did not appear to have support from any political party”. The only foreign contributor, Chandrika Kaul, an authority on journalism in the British empire, discusses the role of the local English language press and the particular contributions of Strickland and Sir Augustus Bartolo, which helped to promote the island in “the context of a fast-evolving media environment and shifts in the balance of political power as decolonisation gathered momentum”. They also strengthened “the appeal of their political parties, policies, and personal standing”. The European Press Union and the Commonwealth Press Union both gave Strickland and Sir Augustus rostra to raise important questions on press freedom and to criticise the culture of secular and religious control in Malta. The references of the various contributions are unfortunately not consistent, while, in giving bibliographic details, it is standard bibliographic practice for the place of publication to be given rather than the name of the publisher. Mabel Strickland. Bejn Storja u Miti comes with an interesting collection of pictures. For those of us who remember her as a very tall, gawky figure with a heavy masculine voice, the picture of a young, elegant, demure Miss Strickland comes across as a most surprising and pleasant discovery.